That isn't Indy's stuff. That equipment belongs to Dr. Henry Jones, Sr! Well, yeah... I'm an *old* dude! Indy is young enough to be my bloody grandson, actually. I haven't taken any photos of the WWI/WWII era belt and holster yet since I've been working on 1850s to 1870s-era outfits lately. I'll get to doing an update on my steampunk Indy outfit in the next couple of months though, if you really want to see it. I want to finish this latest project during the next week so that I can have it all ready for a photoshoot next Saturday. As I said above in my post, the steampunk Indy was the first outfit that I ever put together. Surprisingly, all of that one came out of my closet - without having to buy anything extra for it. 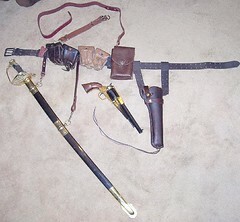 Just my normal work clothes, one of my hats, one of my guns, and the belt-rig that I'd just then finished. Now that I have something that is actually period-accurate for Indy, I can do it again with a somewhat better effect.